Morehead, KY – Austin Peay State University’s baseball team fell into early deficits twice and each time they proved too much overcome as it dropped both games of an Ohio Valley Conference doubleheader, 11-1 and 7-6, Friday at Allen Field. Morehead State (26-18, 12-8 OVC) jumped out to big leads in both contests as it solved Austin Peay starters Alex Robles and Michael Costanzo, respectively, early. In the opener, the Eagles scored four runs in the first and held a 7-1 advantage after five innings. The story was much the same in the nightcap, as it pushed three across in the second inning and held a 7-0 lead after four frames. Austin Peay (25-16, 15-8 OVC) had its difficulties solving Morehead State Game 1 starter Patrick McGuff. The Governors saw eight of their first 10 batters retired before McGuff ran into control issues in the third. He would walk the bases loaded but escaped the jam when designated hitter Alex Robles‘ line drive to center field was caught at the fence. 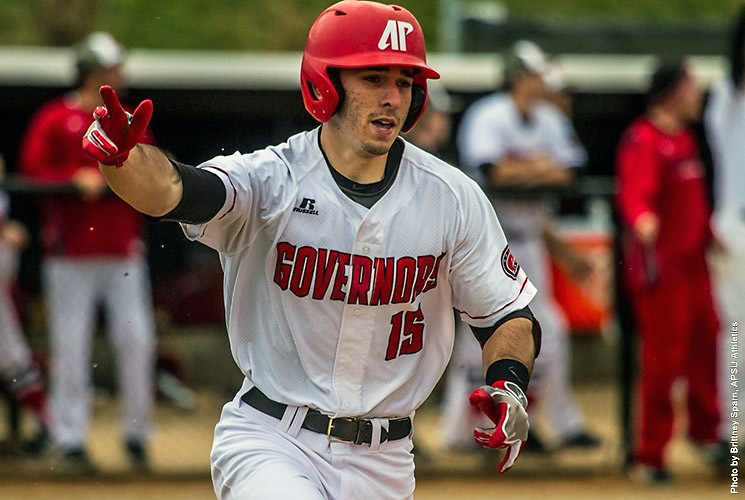 The Govs lone run in the opener came in the fourth after McGuff walked leadoff hitter Ridge Smith, who promptly stole second base. Left fielder Josh Wilson singled in front of shortstop TJ Conroy who hit a fly ball to deep left center to allow Smith to score from third. McGuff would retire the next five batters and would allow only two more hits, a double in both the sixth and seventh innings. Reliever Jason Goe allowed a one-out walk in the ninth but Morehead State turned a double play to end the game. Austin Peay was helped into its 7-0 deficit in Game 2 by Eagles starter Matt Anderson. The senior right-hander struck out sixth batters while holding APSU scoreless through four frames. The Governors broke through in the fifth when Conroy led off with a single and scored on center fielder Patrick Massoni‘s one-out single. Left fielder Logan Gray followed with a towering home run to right center, cutting the deficit to 7-3. Two innings later, second baseman Garrett Copeland led off with a triple into the right field corner. He would score on Massoni’s ground out, cutting the deficit to three runs, 7-4. Austin Peay would keep the pressure up in the eighth as Robles and right fielder Chase Hamilton hit back-to-back doubles, getting APSU within two runs. After a hit batsman, pinch hitter Josh Wilson reached on a fielder’s choice that allowed Hamilton to score and APSU was within a run, 7-6. However, Morehead State reliever Tyler Keele struck out the next batter to end the threat. The Governors got one final change to level the score after Massoni walked to start the ninth. Keele struck out a batter and then induced a fly out before suffering an injury to his hand. After several minutes to treat the injury, Keele induced an infield pop out to end the game. Robles (7-4) was handed the loss in Game 1 after allowing eight runs on 12 hits in six-plus innings. Costanzo (6-3) remained winless on the road after allowing seven runs (five earned) on seven hits in four innings of Game 2. Austin Peay’s offense was held to four hits in the first game, Conroy going hitless officially while driving in the Govs lone run. In the nightcap, Austin Peay posted 11 hits – six for extra bases – as Gray led the way with a 3-for-5, two RBI effort. Morehead State starters Patrick McGuff (4-3) and Matt Anderson (6-2) picked up the wins in Game 1 and 2, respectively. McGuff held APSU to one run on four hits and five walks over eight innings. Anderson struck out 12 batters in 6.2 innings, allowing four runs on nine hits. Keele was credited with his sixth save with two scoreless innings in the nightcap. The Eagles posted 26 hits in the doubleheader, center fielder Ryan Kent and right fielder Will Schneider each finishing with six hits. Schneider had two home runs in the opener, a two-run shot in the fifth and a three-run blast in the eighth. Kent reached base in front of Schneider in eight of his 10 plate appearances, going 3-for-3 with four runs scored in the opener. Austin Peay and Morehead State will attempt to conclude the three-game series with a 1:00pm (CT), Saturday contest, weather permitting. Follow Austin Peay baseball on Twitter (@AustinPeayBSB) for schedule updates. Austin Peay State University Sports Information provides the latest news and updates on the Athletic endeavors of the student-athletes at APSU. Under the direction of Brad Kirtley, the APSU SID’s office consists of Cody Bush, and Colby Wilson. To contact the APSU Sports Information office, contact, 931.221.7561.